It often seems that the explanation of a lunar conundrum ought to become clear if only we had a little better resolution. 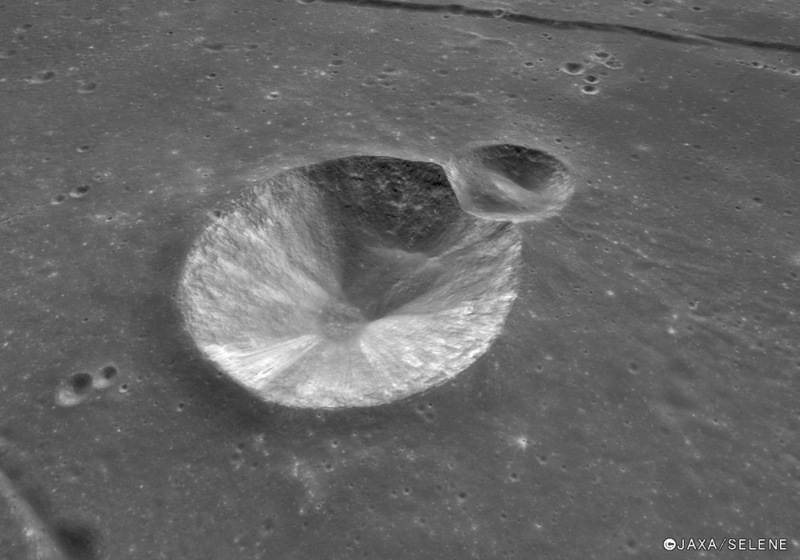 Here is superb resolution from the Kaguya Terrain Camera, so which formed first, Birt or the crater on its rim, Birt A? There are three options: Birt formed first. Birt A formed first. They formed simultaneously. The observations we can make that might be relevant are that both crater rims are low where they intersect, and that rim material has been displaced toward both their floors. If the little crater Birt A formed first I would expect that it would have been more devastated by the formation of the larger crater - so I am content to reject the A first option. Birt forming first is consistent with the overhead view of Clementine that A's rim cuts Birt's - the missing rim from the overlap does not go halfway between each crater, but impinges on Birt's space. A characteristic of craters formed simultaneously is a straight rim septum that divides the space equally. So probably the two didn't form at the same time. If A formed last, the remaining option, the only thing to explain is the material filling much of A's floor. Essentially, A formed on tilted terrain so gravity drew onto its floor much of the material it excavated from the Birt's rim. Does that seem likely? This page was last modified on 10 February 2019, at 02:03.